Hassan Rouhani in a stunning apparent victory. UPDATE—Iran’s interior ministry confirmed on Saturday that Hassan Rouhani, the standard-bearer of the reformist movement and a decided moderate in Iran’s political spectrum, will be the next president, succeeding Mahmoud Ahmadinejad in August. His election means big changes, and a new attitude that will eventually carry over into foreign policy. 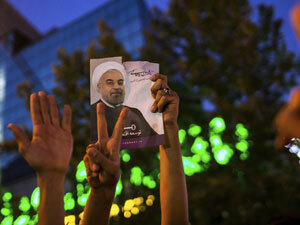 Celebrations, including dancing in the street, greeted the announcement that Rouhani had won. Wild celebrations broke out on Tehran streets that were battlefields four years ago as reformist-backed Hasan Rowhani capped a stunning surge to claim Iran's presidency on Saturday, throwing open the political order after relentless crackdowns by hard-liners to consolidate and safeguard their grip on power. "Long live Rowhani," tens of thousands of jubilant supporters chanted as security officials made no attempt to rein in crowds — joyous and even a bit bewildered by the scope of his victory with more than three times the votes of his nearest rival. He’s emerged as something of a champion of women’s rights and liberalization of the morality-police repression in the name of ultra Islam, which no doubt helped him amass a total of 50.7 percent of the vote, enough to avoid a runoff on June 21. ORIGINAL POST—The apparent victory by Hassan Rouhani in Iran’s presidential election yesterday is a game-changer. The results aren’t official yet, but Rouhani, who’d been endorsed by two former presidents, Ayatollah Ali Akbar Hashemi Rafsanjani and Mohammad Khatami—the billionaire businessman who’d backed the reformists in 2009 and the godfather of the reformist movement—was riding an electoral wave. As the votes mounted, his total passed the critical 50 percent threshold that would avoid a runoff election next Friday. The other candidates, including a passel of conservatives supposedly including the one “anointed” by Ayatollah Ali Khamenei, the supreme leader, all had percentages in the teens or below. So much for the idea that elections in Iran are a joke. So much for the idea that Iran’s voters were so disenchanted by the aftermath of the 2009 election that they’d boycott the vote. So much for the idea that Khamenei, insisting on the election of an ultra-conservative, would rig the vote count against Rouhani, who’d emerged as the standard-bearer for the reformist movement. So much for those analysts who argued that the Green Movement was dead and buried. Meanwhile, the former nuclear negotiator for Iran under President Khatami and, before that, top national security adviser to President Rafsanjani will have a chance to “reset” relations with the United States. Just as important, the emergence of Rouhani as president of Iran gives President Obama a tremendous opportunity to restart talks with Iran on a new basis; and the fact that Iran’s next president won’t be named Ahmadinejad means that all of the efforts by hawks, neoconservatives and the Israel lobby to demonize Ahmadinejad are now for naught. Now that Rouhani might be president, it also means that many of the former officials, ambassadors and policy experts ousted by Ahmadinejad (and kept in political exile by the conservative coalition and military-dominated bloc that ruled Iran under him) can return to office. The results, of course, have to be certified by the Interior Ministry, still under the control of Ahmadinejad. And, there’s still a chance that the Guardian Council will weigh in. But the announced results so overwhelmingly favor Rouhani that he seems locked in, and if his total falls below 50 percent he’d still be a shoo-in in a two-person runoff. Listen, now, to the American right-wing and neoconservatives, who’ll argue that the election doesn’t matter, since Ayatollah Khamenei controls policy and decision-making. True, under the Iranian system, the supreme leader is very, very powerful. But Rouhani’s election means that there will be a new team in place, and that Khamenei will have to accommodate it. The last time a reformist was president, intended reforms—enacted by a reformist-controlled parliament—were nearly all overturned by the Guardian Council, with Khamenei’s approval. On the other hand, President Khatami, with Rouhani at the head of the nuclear negotiation team, did indeed negotiate with the European Union in good faith, and at one point (until the election of Ahmadinejad in 2005) Iran suspended the enrichment of uranium temporarily in order to help the talks succeed. This is a remarkable and welcome result so far and I’m keeping my fingers crossed that there will be no jiggery-pokery with the final result. What this huge vote of confidence in Doctor Rouhani appears to show is a hunger by the Iranian people to break away from the arid and self-defeating approach of the past and for more constructive relations with the West. On a personal level I found him warm and engaging. He is a strong Iranian patriot and he was tough, but fair to deal with and always on top of his brief.